Offering a first-class boat launch, Rusty's Coulee Marina is the ideal beginning to your Lake Diefenbaker exploration. Whether it be fishing, wakeboarding, tubing or just plain cruising, Rusty's is the place to get on the water. Need some fuel for your watercraft? We've got it. Need some bait? Got that too. How about a fishing license? We offer those as well ... you name it, the marina store more than likely has it. Offering assorted tackle, baits, and marine supplies (including boat batteries! ), the store also has a variety of convenience store items including soft-serve ice cream, firewood and ice for sale during the summer. The marina's schedule and fees have yet to be finalized for the 2018 season, so the listings below may be inaccurate. 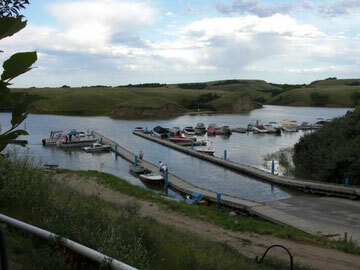 For detailed information, you may call the marina directly at (306) 353-4449. Please call the marina store after May 19th to confirm dates and hours of operation. There will be notices posted on this website and at the Marina as well with hours of operation when they have been finalized. Launch fees are payable at the marina store prior to launching your watercraft. Most days, launching and retrieval of boats at Rusty’s Coulee Marina is simple. However, on long weekends or when the weather is perfect and the lake inviting, the launch area can become so busy that both launching and retrieval are stressful and confusing. This information is provided to make your launch and retrieval experience at Rusty’s Coulee Marina a more pleasant one. Use two experienced people to launch and retrieve the vessel - one to drive the towing vehicle and one to operate the vessel. Never block the ramp or a launch lane with an unattended vessel or vehicle. When there are boats coming in and a boat is launching out, give the launching boat plenty of space to maneuver out of the launch area so as to not interrupt the flow of traffic. The retrieval line is formed by vehicles with trailers, not by vessels in the water. Do not pull your vessel into a launch lane until your towing vehicle is at the ramp. You can drop off your towing vehicle driver at the gas area or at the end of the dock and then idle in the open water while waiting. Filling the launch area with boats causes congestion and ‘ramp rage’. When you see your trailer coming down the launch, make your way slowly and carefully into the launch and load your boat. 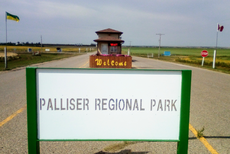 Palliser Regional Park and Rusty's Coulee Marina thank you for your consideration and cooperation in making the boat launch run smoothly by following these recommendations. Follow these simple rules when the launch is busy! Payment for seasonal slips must be made before June 16th, 2017. NO EXCEPTIONS. If your payment is not received by June 16th, your slip reservation will be surrendered. If you are unable to come to the Marina before June 16th, please download, complete and return the Boat Slip Permit Application form. For payment options, please call the Marina Store at (306) 353-4449 during hours of operation or the Park Office at (306) 353-4604. Please Note: this year there is a section on the form that asks if you have your Pleasure Craft Operator Card. This is your proof of competency and it is required by Transport Canada. If you don’t have Proof of Competency – Get It! When available, the rates to rent a slip on a non-seasonal basis are as follows, regardless of slip size. Currently, the Marina has a lengthy waiting list for seasonal boat slips. For more information on adding your name to the slip rental list, please download, complete and return the Boat Slip Waiting List Application to the Marina Store or the park office. Complete and return this form to the Marina Store or the Park Office to get your boat added to the waiting list for a seasonal slip at Rusty's Coulee Marina.